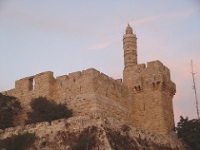 Called the Tower of David, Jerusalem's Citadel is a medieval fortress with architectural elements from later periods. Its tallest tower, the Phasael, is the best place to appreciate its magnificent view of the city. The Citadel contains the excellent Museum of the History of Jerusalem, which displays 4,000 years' worth of the city's past in its rooms and courtyards. Free tours of The Citadel and museum are conducted in Hebrew on Tuesdays at 10:30am, and in English every day except Friday and Saturday at 11am. The 'light and sound' show held almost nightly is also a delightful way to learn about the history of Jerusalem. The Citadel of David is a great first stop for visitors to Jerusalem, as it covers the city's history from biblical times to the present in a very accessible and interesting way. English and Hebrew captions and audio guides are available for visitors who aren't with tour groups. Visitors will also encounter some fascinating architectural elements. Those who struggle with steps should note that there are a lot of them at this site, and that seeing the place properly requires a fair amount of climbing. Transport: Line 38. Lines 13 and 18 stop at King David Street. Admission: NIS 40 for adults, concessions available.